IMPORTANT UPDATE. AVICII HAS BEEN MOVED TO WEDNESDAY DECEMBER 14. 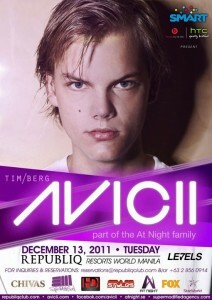 After already announcing Roger Sanchez and Kaskade earlier this year, Republiq now added Avicii to their killer DJ line-up for December 2011. Swedish super star DJ and producer Avicii, who was recently voted 6th best DJ in the world in this year’s DJ Mag top 100, will play live at Republiq on December 13 2011. Avicii is well known for his chart-topping dance hits like Bromance (which he released under his name Tim Berg), Levels and Fade into Darkness. Avicii is a great addition to Republiq’s December line-up, which also includes Roger Sanchez on December 8 and Kaskade on December 15. Tickets can be purchased at Cafe Republiq starting November 4. Pre-sale price is PHP 1500, door price will be PHP 2500.